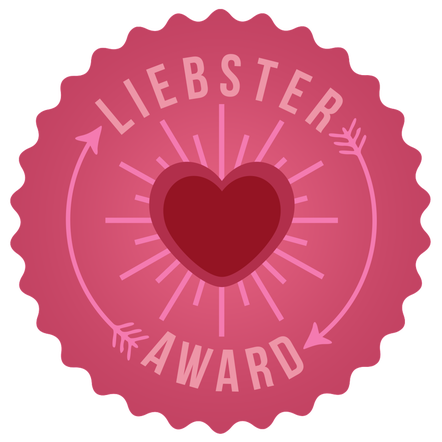 The Liebster Award is (another) lovely thing about the blogging community. It is a great way of getting to know other bloggers and their blogs. I was nominated by Katie at Growing up Katertot. If you haven’t been over to her blog yet, GO! It is much prettier and nicer than mine and full of lovely things. Her Weekly Words of Inspiration is such a positive idea and really lovely to read. I’m also looking forward to reading more of her book reviews and stealing her craft and recipe ideas! I have taken a little while to post this and in the meantime was also nominated by Catherine at Pushing the Moon. Great name yes? Go there too! I particularly like her ‘explore‘ category where she takes us out and about with her family. Her children have an indoor bouncy castle (amazing!) and on her ‘about’ page she expresses an admirable commitment to drinking copious amounts of wine. I can’t wait to get reading more of her blog. 4) Nominate 4-11 bloggers (with fewer than 1,000 followers) who you feel deserve the award. 5) Answer the 11 questions posed by the blogger who nominated you. Rule one completed and I really enjoyed that part. Now on to the rest…. – I love the sea and I love to play ‘silly old sea, can’t catch me!’ with the waves, even now. At 32. After not finding a box to tick one too many times on annoying admin forms. I know I probably shouldn’t let it bother me so much but I didn’t like the definitions offered to me in my new role as a MOTHER who was CHOOSING not to continue with my paid work outside the home. It’s not that Mother is a job…for me it is very definitely a relationship but, come on, do I really only get the option of ‘housewife’ or ‘other’ when filling trying to buy insurance!? I could rant about this for quite some time but I do here and here and so will keep it brief for this answer. It is also about what being a Mother for me means, a call to arms to me to fully ‘occupy’ my new position as a mother. I’m sure this time will pass all too soon in the grand scheme of things and I want to remind myself to be there/here fully for it. 2. Do you have any pets? Tell us about them. No pets, although my husband and I both grew up with dogs, horses, cats, hamsters and a tortoise so I’m sure we’ll get a pet at some point. I imagine a big dog and some quails. And maybe a donkey. Well there would be space for a dog, quails and a donkey! It would have a fireplace and a beautiful big, but not too big, garden. There would be space in the kitchen for my dresser, my table and my kitchen sofa that are not leaving me now. Our bedroom would have an ensuite with a bath. My dream house would not be huge but would look perfect at Christmas-time and Summer. Oh and I’ll probably need to win the lottery to afford it. 4. Do you have a significant other? How did you meet? Yes, my resident sportsman Andrew. We meet in 2001 as we attended the same University. 5. How do you unwind after a difficult day? A long chat with Andrew. A walk in our garden. A glass of wine and lovely food. I do like a UK holiday…Padstow, Ilfracombe and Whitby to name a few, but further afield we love Barbados. One I come back to time and time again is 84 Charing Cross Road / The Duchess of Bloomsbury Street by Helene Hanff. A beautiful book. 8. Describe one of your happiest childhood memories. Too many! I was very lucky to have an extremely happy childhood. Probably going to summer country/agricultural shows. My family were farming and horsey people so getting ringside with a big picnic, all the family and exploring the show would be one of my favourite days out. 9. If you had three wishes, what would they be? 10. Where do you see yourself in 5 years from now? I honestly don’t know. I love eating out! I love a treat meal but I’m happiest in places that are basic, unpretentious and friendly. It also always helps if they’ve got a view! I love fish and chip restaurants by the sea where you can eat in as well as out…on little wooden tables with checked tablecloths and mugs of tea. That’s a winner. 2. If someone asks you if they should start a blog would you say yes or no? And why? Ahh thanks for reading and commenting lovely. Really interesting to hear that it was support that helped you with breastfeeding your daughter. I really believe the right support can be the make or break with how mothers feel about feeding choices. I’m starting to get responses from my liebster nominees now, it’s so fun reading them isn’t it!? Thanks for inviting me to take part.